Starting with Lightspeed OnSite 3.6. you can set your cash drawer to open based on the payment method. 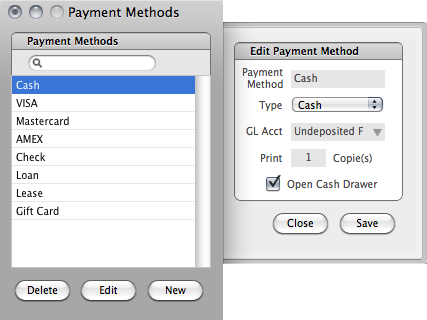 Double-click a payment method and select Open Cash Drawer. The cash drawer will now open when this payment method is used, regardless of whether the connection is USB, through a receipt printer, or a serial adapter. For a user to be able to manually open a cash drawer, they must have this privilege. Go to Setting user privileges for information.